Be amazed and amused by your neighbors! 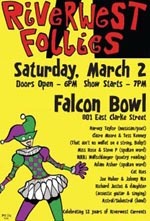 The Riverwest Follies Talent Show returns to the Falcon Bowl Stage on Sat, March 2 with Grand Master Sir Pinkerton Xyloma. The amusing and zany night is hosted by the Riverwest Currents to celebrate 12 years of bringing local news to the greater northeast side community. Don’t miss a minute of the Big Show! Doors open at 6PM, with show at 7PM. For more info, see ad on back page. Performers: Harvey Taylor (musician/poet), Adam Asher (spoken word), Cat Ries, Miss Rose & Steve P (spoken word), Nikki Wallschlaeger (poetry reading), Claire Moore & Tess Kenney (That ain’t no wallet on a string, Baby! ), Joe Huber & Johnny Nix, Richard Justus & daughter (acoustic guitar & singing), Astral/Subastral (band).